ImiNat C (imipenem and cilastatin) by natco is generic version of Primaxin I.M. Primaxin IV.It comes in 500 mg injection form . What is Iminat C (imipenem and cilastatin)? 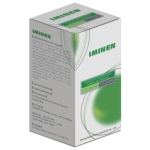 Imipenem is an antibiotic that fights serious infections caused by bacteria. ImiNat C (imipenem and cilastatin) is used to treat severe infections of the lower respiratory tract, skin, stomach, female reproductive organs, and other body systems. 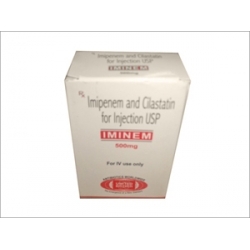 ImiNat C (imipenem and cilastatin) may also be used for purposes other than those listed here. What is the most important information I should know about ImiNat C (imipenem and cilastatin)? Do not use this medication if you are allergic to ImiNat C (imipenem and cilastatin), or to lidocaine or other local anesthetics (numbing medicine). You should not use ImiNat C (imipenem and cilastatin) if you have heart block. Before using ImiNat C (imipenem and cilastatin), tell your doctor if you have kidney disease (or if you are on dialysis), or a seizure disorder. Also tell your doctor if you are either allergic to or are currently taking a penicillin or cephalosporin antibiotic such as Amoxil, Augmentin, Bactocill, Beepen-VK, Ceclor, Ceftin, Duricef, Dycill, Dynapen, Keflex, Ledercillin VK, Omnipen, Pen-V, Pfizerpen, Principen, Veetids, and others. Before using ImiNat C (imipenem and cilastatin), tell your doctor if you are also taking ganciclovir (Cytovene) or probenecid (Benemid). Primaxin IM (for the muscle) and Primaxin IV (for the vein) are different forms of this medicine and should be used only for their specific type of injection. Do not inject Primaxin IM into a vein and do not inject Primaxin IV into a muscle. Call your doctor at once if you have serious side effects such as pounding heartbeats, confusion, hallucinations, seizure (convulsions), feeling light-headed, fainting, flu symptoms, nausea, stomach pain, loss of appetite, dark urine, jaundice (yellowing of the skin or eyes), or a severe blistering, peeling, and red skin rash. Less serious side effects may include pain, swelling, or redness where the medicine was injected, mild stomach discomfort, sore throat, vaginal itching or discharge, mild skin rash, dizziness or tired feeling, numbness or tingling, or ringing in your ears. What should I discuss with my healthcare provider before use ImiNat C (imipenem and cilastatin)? a history of allergy to cephalosporin antibiotics such as Ceclor, Ceftin, Duricef, Keflex, and others. If you have any of these conditions, you may not be able to use ImiNat C (imipenem and cilastatin), or you may need a dose adjustment or special tests during treatment. FDA pregnancy category C. This medication may be harmful to an unborn baby. Tell your doctor if you are pregnant or plan to become pregnant during treatment. It is not known whether ImiNat C (imipenem and cilastatin) passes into breast milk or if it could harm a nursing baby. Do not use this medication without telling your doctor if you are breast-feeding a baby. How should I use ImiNat C (imipenem and cilastatin)? 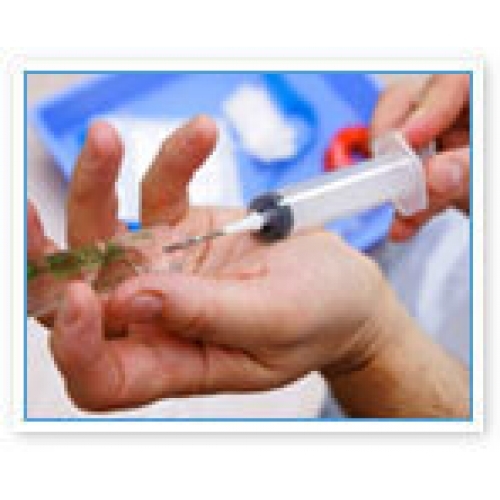 ImiNat C (imipenem and cilastatin) is given as an injection through a needle placed into a vein (IV) or into a muscle (IM). ImiNat C (imipenem and cilastatin) is usually given in a clinic or hospital setting. The IV medicine must be given as a slow infusion and can take up to an hour to complete. Tell your caregiver if you feel nauseated during the infusion. You may need to receive the medicine at a slower rate. 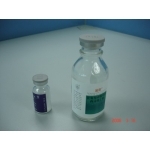 The IM form of ImiNat C (imipenem and cilastatin) is given as a rapid injection into a muscle. You may be given instructions on how to inject your medicine at home. Do not use this medicine at home if you do not fully understand how to give the injection and properly dispose of needles and other items used in giving the medicine. ImiNat C (imipenem and cilastatin) is usually given as long as needed until your infection has cleared or you have been symptom-free for at least 48 hours. Use this medication for the entire length of time prescribed by your doctor. Your symptoms may get better before the infection is completely treated.ImiNat C ImiNat C (imipenem and cilastatin) will not treat a viral infection such as the common cold or flu. Do not give this medication to another person, even if they have the same symptoms you do. ImiNat C (imipenem and cilastatin) is a powder that must be mixed with a liquid (diluent). Primaxin IM and Primaxin IV are each mixed with different types of diluent. Do not mix Primaxin IM or draw your dose into a syringe until you are ready to inject the medicine. After mixing Primaxin IV, you may keep it in a refrigerator and use it within 24 hours. You may also store the mixed IV medicine at room temperature if you use it within 4 hours. Store unmixed ImiNat C (imipenem and cilastatin) powder at room temperature away from moisture and heat. If ImiNat C (imipenem and cilastatin) is given in a hospital setting, it is not likely that you will miss a dose. If you are using the medication at home and you miss a dose, give the injection as soon as you remember. If it is almost time for your next dose, skip the missed dose and use the medicine at your next regularly scheduled time. Do not use extra medicine to make up the missed dose. Symptoms of an ImiNat C (imipenem and cilastatin) overdose may include weakness, drooping eyelid, tremors, trouble breathing, or seizure (black-out or convulsions). What should I avoid while using ImiNat C (imipenem and cilastatin)? Duration: Parenteral therapy should be continued until the patient's clinical condition stabilizes and fever subsides. Oral antibiotic therapy may then be initiated according to microbiologic sensitivity data. Therapy of documented anaerobic pleuropulmonary infections should be continued until the infiltrate is cleared or a residual scar forms, sometimes requiring 2 to 4 months. Duration: Once the patient is stable and afebrile for at least 24 hours, and the absolute neutrophil count is at least 500 cells/mm3, oral antimicrobial therapy, based on susceptibility patterns, may be initiated. Then duration of therapy is dependent on the clinical situation. Longer therapy, 6 weeks or more, may be required for prosthetic joint infections. Treatment of meningitis due to Listeria species should be continued for 3 to 6 weeks. Chronic osteomyelitis may require additional oral antimicrobial therapy, possibly for up to 6 months. Surgical debridement of devitalized bone is also critical. For more severe infections, such as diabetic soft tissue infections, 14 to 21 days of therapy may be required. Safety and efficacy of imipenem-cilastatin IM in pediatric patients below the age of 12 years have not been established. What other drugs will affect ImiNat C (imipenem and cilastatin)? a cephalosporin antibiotic such as cefaclor (Ceclor), cefuroxime (Ceftin), cefadroxil (Duricef), cephalexin (Keflex), and others. Talk to your doctor and pharmacist before use ImiNat C (imipenem and cilastatin) if you are use any other prescription or over-the-counter medicines, including vitamins, minerals, and herbal products. Your pharmacist has information about ImiNat C (imipenem and cilastatin) written for health professionals that you may read.